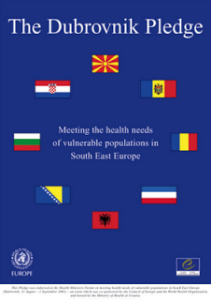 The Dubrovnik Pledge on meeting the health needs of vulnerable populations in south-eastern Europe (SEE) was a cornerstone agreement for cooperation and action on health. 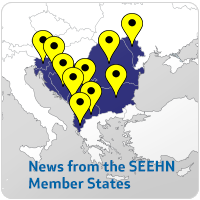 This was the first-ever political document on cross-border health development in the SEE region. It was signed by the ministers of health on 2 September 2001, at their first SEE ministerial forum. The process was supported by the Council of Europe and WHO Regional Office for Europe in the framework of the Stability Pact. The Dubrovnik Pledge committed the governments of Albania, Bosnia and Herzegovina, Bulgaria, Croatia, the Republic of Moldova, Romania, Serbia and Montenegro, and The former Yugoslav Republic of Macedonia to modernizing seven areas of public health of common interest.